A citizen-organised cleaning drive at the garbage ridden Agara Lake in south-east Bangalore, saw children and adults pitch in with enthusiasm. City birders find the annual HSBC Bangalore Bird Race an exciting and rewarding experience. 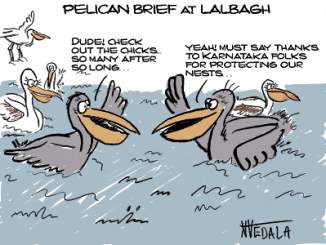 Pelican population sees a recent increase. Not long ago, they were an endangered species; now, they throng the water bodies around the city. Hail the revival of the pelican! The Central Jail in Bengaluru has become ‘Freedom Park’, on the lines of the famous Hyde Park in London. Read about the facilities the BBMP is promising. Bangalore has many species of birds, fast depleting because of the city’s exponential growth. We start a new series to get you started with bird watching in the city. Chairman Yellapa Reddy, of Bengaluru’s oversight committee on road widening found himself on the back foot in a hearing at the High Court. The citizens vs authorities saga continues.